This EP is not like music I typically receive – even though I’d call it “acoustic,” it’s pretty far from the typical twang that I usually pursue. 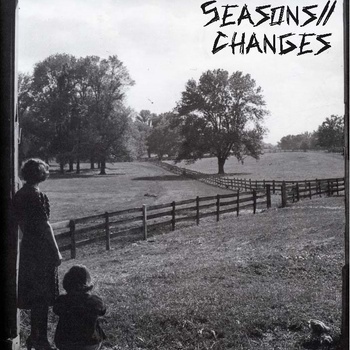 Seasons//Changes by Here, Hear – the one-man project of Louisville’s Davin Jones – is a seven song collection that comes in sounding a little like a cross between Connor Oberst and early Modest Mouse. Why Connor Oberst? Because it’s downright dreary in atmosphere for the most part – it comes pretty close to the confessional songwriting of much of his material, and at times his vocals even sound a little like him. Early Modest Mouse? I got this vibe mostly from the sixth song, “The John Hughes Blues,” with its picking and bends, but the whole album comes in with a certain amount of lo-fidelity that can be found on their earlier albums. The sound on the album is interesting, because lord knows, that with the type of equipment available today for low cost, it’s not that difficult to make a recording of guitar and voice sound crisp and clean – I tend to think that it was a bit of an artistic decision by the musician, and it certainly adds to the ambiance of the album. This suspicion of intentional-sound-choice is only made stronger for me when I see on his Bandcamp page “all recordings were done in one session.” It puts across an air of catharsis and release, that these songs were all put out in one big purge – appropriate for their subject matters. If you’re young and familiar with feelings of emotionalism and vulnerability, this one might just be for you – as so many already have, Here, Hear uses the song as an art form for expression. As I read Andrew Bird recently wondering, “Why is the song safe?” It doesn’t have to be universally so, but for some people it is, and to varying degrees – that’s what makes everyone’s music unique from one another.